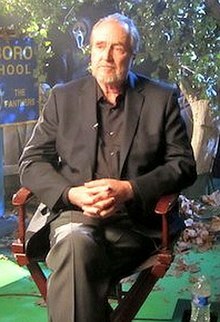 Wes Craven (August 2, 1939 – August 30, 2015) wis an American movie director. He wis born in Cleveland, Ohio. He wis well kent for horror movie classics includin A Nightmare on Elm Street an Scream. On August 30, 2015, Wes Craven deit o brain cancer at his home in Los Angeles. He wis 76 years auld. ↑ "Wes Craven, Horror Maestro, Dies at 76". The Hollywood Reporter. August 30, 2015. Retrieved August 30, 2015.